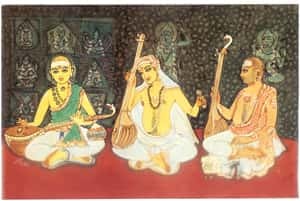 The trinity: (from left to right) Muthuswami Dikshitar, Tyagaraja and Shyama Shastri. Talent is a funny thing. It’s rare and elusive enough to be lusted after, to be treasured when found, and to be squandered with a single misstep. And yet, when it rains it pours, especially in music. In three years in the early 1940s, John Lennon, Paul McCartney and George Harrison were born a few miles from each other in Liverpool. In Vienna, within a few decades, Ludwig van Beethoven, Wolfgang Amadeus Mozart, Franz Schubert and Joseph Haydn converged to redefine Western classical music. For sheer prolificacy, and for a canon that defines many, many ragas as we know them today, we look to Tyagaraja (1767-1847). He was McCartney, if you will: The most easily beloved, the most covered, the one with not only an enviably long life but also an enviable artistic permanence. Entire concerts can be built solely around Tyagaraja’s compositions without seeming unorthodox or partial. It would perhaps stretch the Beatles analogy too much to connect Dikshitar with Harrison (widely travelled in north India? more musically complex?) and Shastri with Lennon (more soulful?). Dikshitar is the academician’s composer of choice, his lyrics in scholarly Sanskrit and his music intricate but rewarding to deconstruct. Shastri’s music, most of it dedicated to Devi, the female embodiment of the divine, is so intensely devotional and poetic that it verges on the amorous. Of the goddess Kamakshi, in a song in the Raga Kalyani, he wrote: “Her form shines like gold. She has lotus eyes... Her face resembles the moon, and her neck glitters with pearls and gems." The conventional logic to explain these dense explosions of talent, as in Liverpool and Vienna, is that they couldn’t have happened without each musician feeding off the other. So Lennon and McCartney would have remained individually promising musicians, but they could have only achieved the dizzy heights of Beatlemania in association with each other and with Harrison. In Vienna, Mozart befriended Haydn; Beethoven travelled from Bonn to Vienna to study with Mozart, although he wound up studying under Haydn; Schubert trained under Antonio Salieri, Mozart’s great rival. When such mighty rivers flow into each other, the resulting pool is deep indeed. It appears, from the scant details we have about their lives, that such was partly the case with Carnatic music’s Trinity also. Some scholars maintain that Shastri befriended Dikshitar, but that he met Tyagaraja only a few times; others insist that Tyagaraja never met his two peers and that he worked in splendid isolation. Really, the truth is difficult to pin down with any certitude. But there exists a dream history project in researching the thriving, musically charged atmosphere that seemed to have settled like a cloak over the Thanjavur district in the late 18th century.